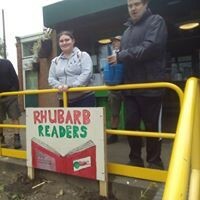 Our Rhubarb Readers Group is going from strength to strength and we have now taken on the maintenance of the library garden. The group is led by Denise, our training officer, who takes along a small group of volunteers for reading practice and to choose suitable reading materials. 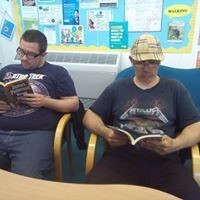 Some of the volunteers cannot read at all but enjoy the library experience. 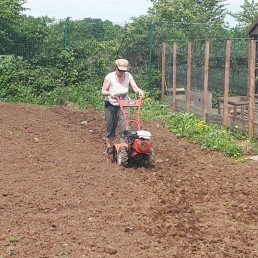 Although we have had a long period of dry, very cold weather, the seedlings are doing well, our production is heading in the right direction for good crops, and everyone is busy sowing, potting-on, transplanting, preparing ground, weeding and even picking fabulous peas from our polytunnel! 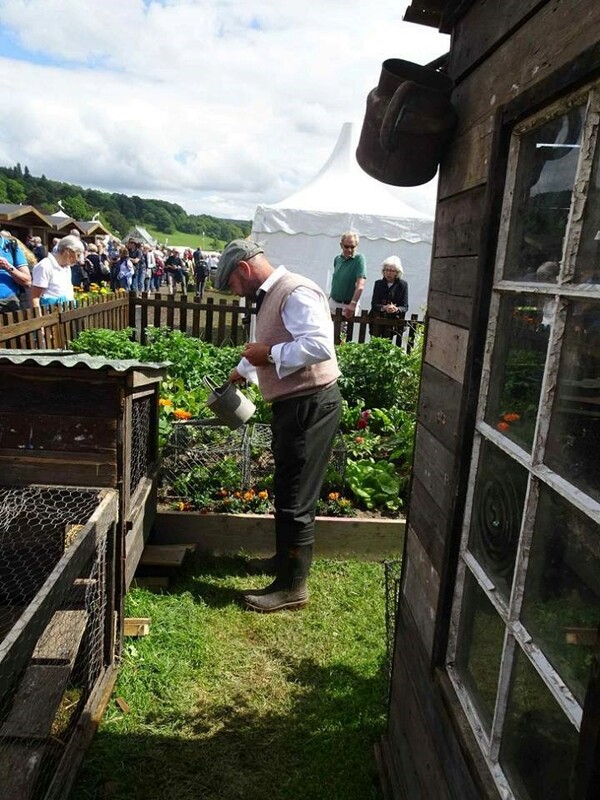 Preparations are well under way for our Edible Feature at the RHS Chatsworth Flower Show, and on Wednesday 24th May we held a dress rehearsal day for our 1940’s clothing that we will be wearing. 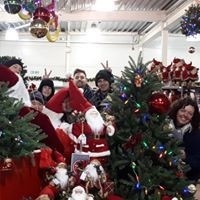 We were helped with this by a local resident and her daughter and had great fun doing all this after months of buying clothes, as well as lots of men’s clothes in charity shops and online, and getting in the mood. 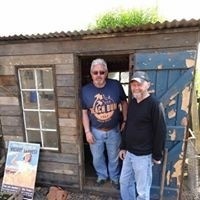 Our Rhubarb Shed Men team have also been busy creating an old shed for the recreated 1940’s allotment and housing for the 4 hens that will be joining us for the week. 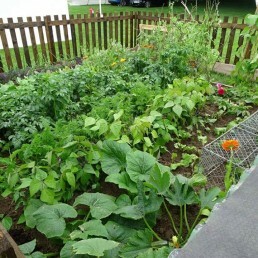 In addition to the 1940’s allotment we are also creating a Garden for Hard Times. 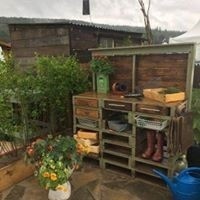 In this area we want to demonstrate just what can be done in a small area using recycled materials,building a potting bench from old pallets, planting in tyres and a greenhouse made of pop bottles to name but a few ideas. All our volunteers have become engaged with the Chatsworth preparations and many of them will be joining staff throughout the week to show case our work. 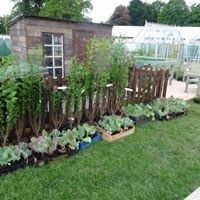 On Saturday 3rd June, 8 Rhubarb Farm staff and volunteers worked the whole day to get the planting done on our Edible Feature at RHS Chatsworth Show. 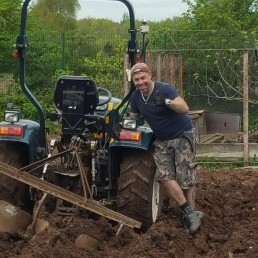 We did not realise how much soil was needed for the planting, so when we had nearly finished the 4th ton bag, we requested another ton, and the RHS kindly sent a digger full! The theme for the week was RAIN! Monday was the last day of the Build and Tuesday 6th was Press Day. Both were badly affected by the rain, and on Press Day the Show was closed at 1pm. Our Press Call was at 1.30 but as the Show was closed at 1pm, we lost out there. 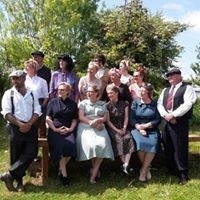 However, we were photographed by the Worksop Guardian, Derbyshire Life magazine, The Manchester Guardian and Redbrick PR. 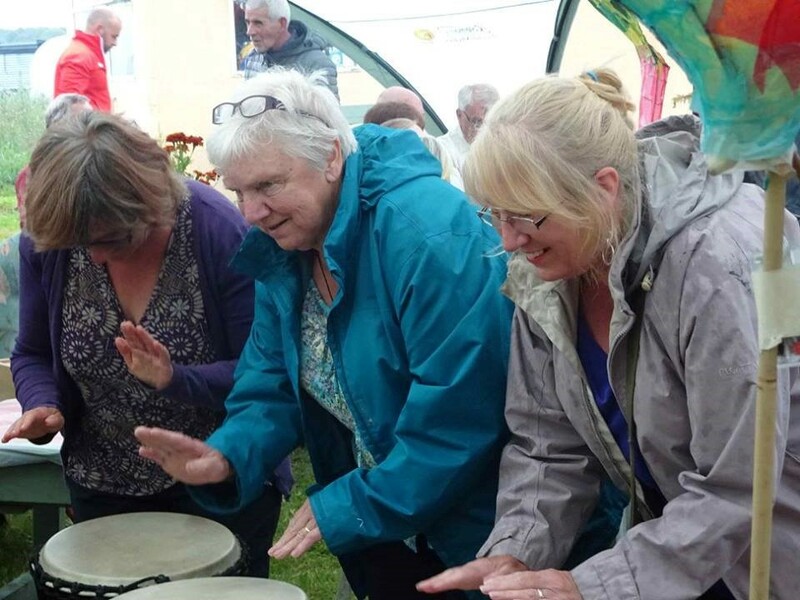 As the week went on the weather was mixed, mostly rain with a little sun between the showers, but the weather did not dampen our spirits or deter the thousands of visitors. 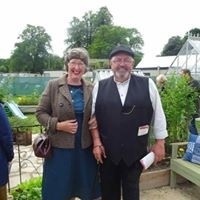 We had a fabulous week, staff and volunteers worked together to make this an event one that we will always remember and everyone we spoke to commented that they thought our edible feature was far better display than many of the show gardens. 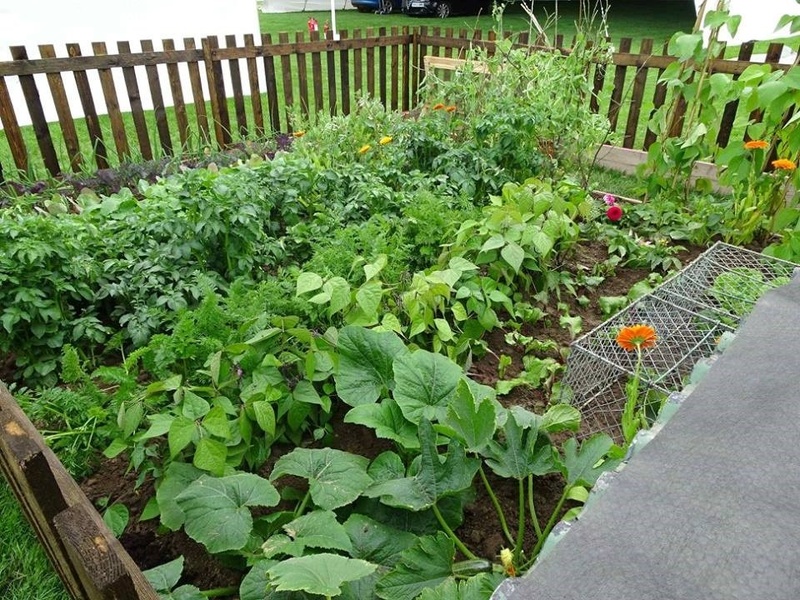 Not a bad achievement for little old Rhubarb Farm! 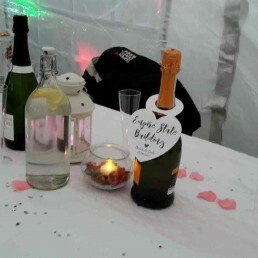 Our volunteer celebrations took place and despite the fact that it had rained most of the day, and rained throughout the evening, 47 volunteers turned up, many with their families and friends, to celebrate all the great work they do to make the Farm a success. 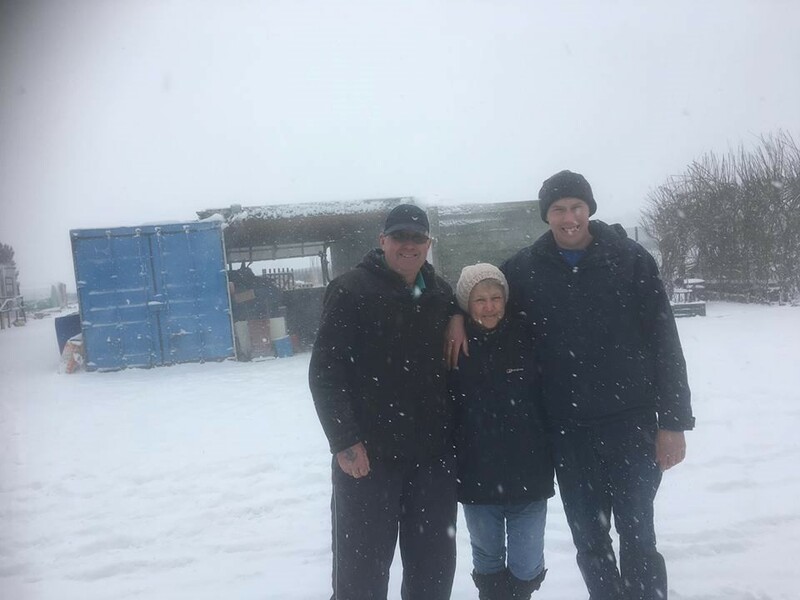 Their dedication in turning up on such a horrid evening shows how much the Farm means to them, and we value them so much. 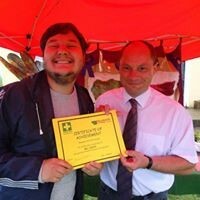 This is an annual event, always popular with our volunteers and their families and this year Kevin Gillott, the Deputy Police and Crime Commissioner for Derbyshire, gave out the certificates to all everyone. 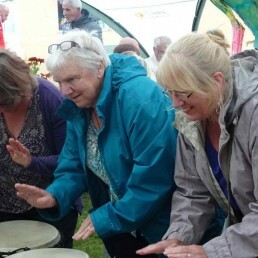 As people gathered and took shelter we held a drumming workshop and following the presentations staff took to the BBQ and served hot drinks and cakes to make sure everyone went home warm and well fed. 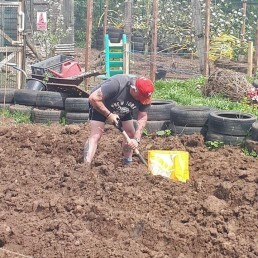 On Thursday 6th July a group of 7 staff members of Pattonair, Derby, came for a day’s volunteering at the Farm. They did an amazing amount of work, and really helped us with a lot of things. 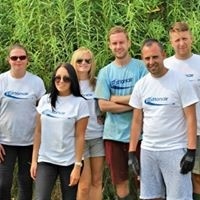 We offer the corporate days to help raise awareness of our work within the business community and his group were brought to the Farm by an organisation called Business Volunteers, who were impressed with the volunteering opportunities and plan to bring other groups to the Farm in the future. 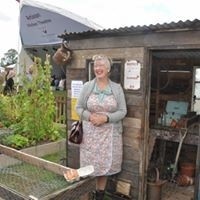 On Monday 14th August, the Rhubarb Shed Men Project was officially opened by Cllr Joan Dixon. 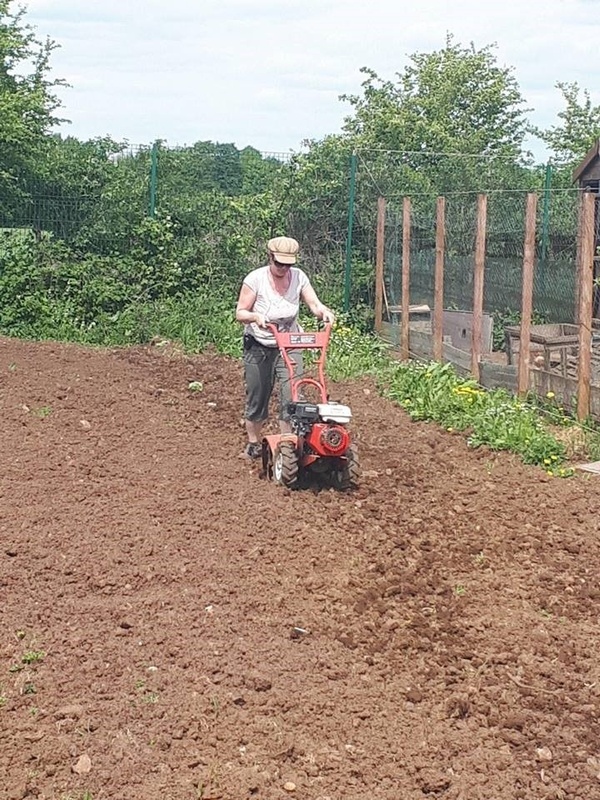 It was Joan who enabled Rhubarb Farm to receive a generous grant to set up the Project through the Derbyshire County Council Community Priorities Programme. 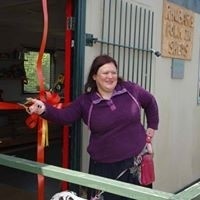 Joan gave a lovely speech and then cut the ribbon into the cabin where the Shed Men Project is located. 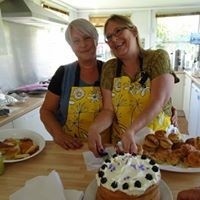 Then everyone adjourned to the cafe to collect delicious cakes and buns served by Anita and volunteer Theresa. 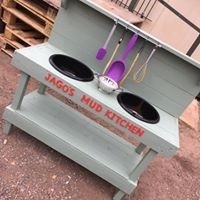 Our Shed Men can turn their hand to anything and are now taking custom orders, however the garden benches and tables are the most popular items closely followed by the children’s mud kitchens, an asset to any family garden. 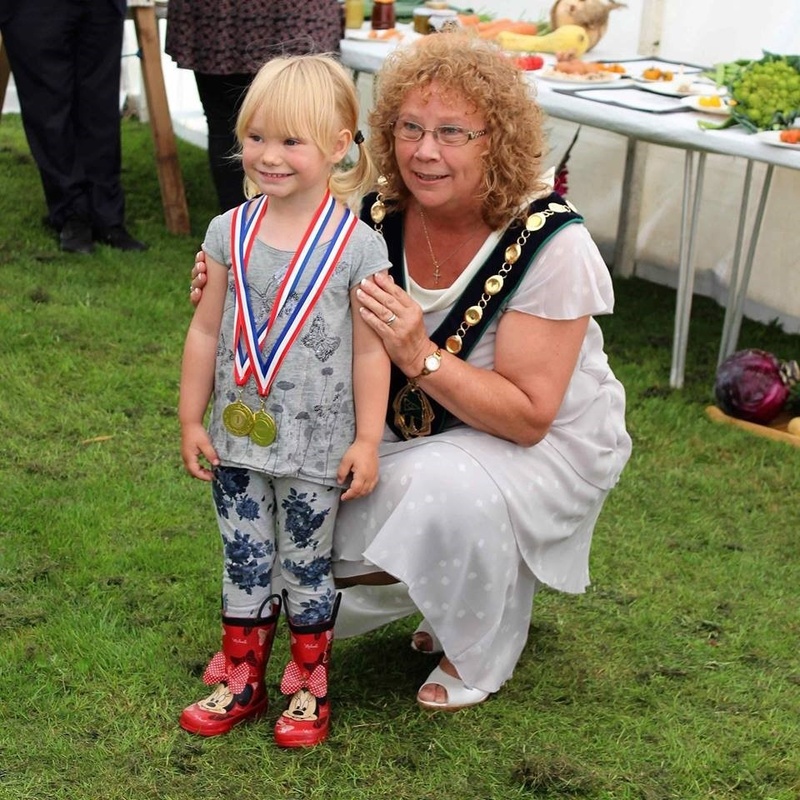 September is always about the annual Langwith Show, and this year the weather was good to us ensuring that everyone had a fantastic day. Months of planning go into this community event and it gets bigger and better every year. 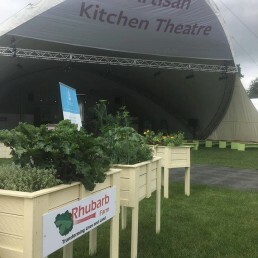 Our produce marquee houses the main even, the produce show, with classes for everyone to enter, from the heaviest marrow to classes specifically for children. 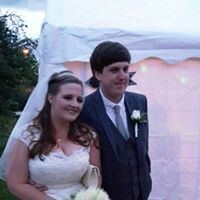 September also saw a historic first for the Farm when Becca and Josh held their wedding reception at the Farm. Becca and Josh had married the previous week in Central Park, New York. 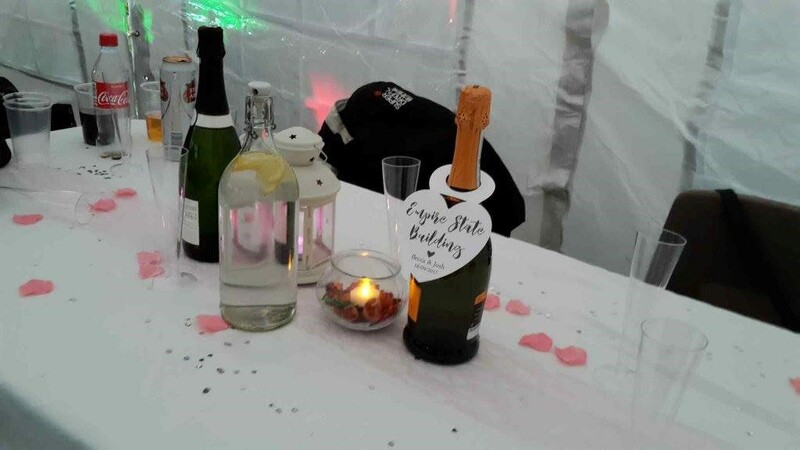 The reception was held in two large marquees, on the Village Green, with a bouncy castle to keep the children happy, a disco and rig run by Rhubarb Farm Buddy Worker Martin, and a fabulous cake with the New York Skyline around its sides made by one granny. 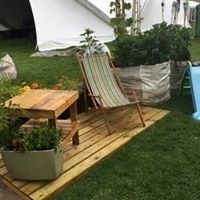 Becca commented on the Farm’s staff and volunteers who had erected the marquees, “I was amazed to see the setup of the gazebos, and how people from all backgrounds worked so well as a team and how welcome they made me feel”. 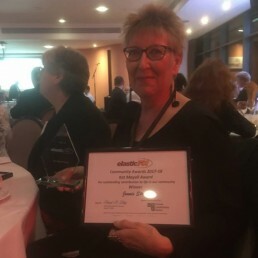 Rhubarb Farm won the award for Social Enterprise of the Year at the Rural Business Awards at a ceremony at Denbies Winery, Dorking, Surrey on Thursday 5th October. Anita and Jenni travelled down, but we could only do this because our dinner was sponsored by a company called Wealth Management. 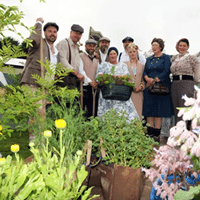 It was a grand affair, sponsored by Amazon and the County Landowners Association, with Jules Hudson of Countryfile as MC, and many different rural businesses from around the country there. We were up against some very stiff competition for this award and it was a very proud moment when they accounced us the winners and we saw our name on the big screen! 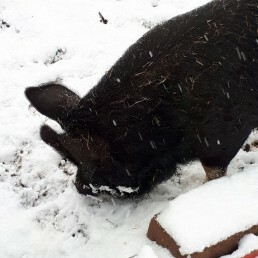 We have now ventured into pig-keeping. 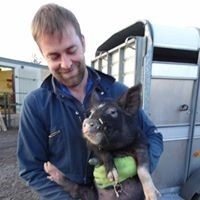 Tom Beckingham, of Little Morton Farm, Wingerworth, delivered 4 Berkshire piglets as a donation for our work. 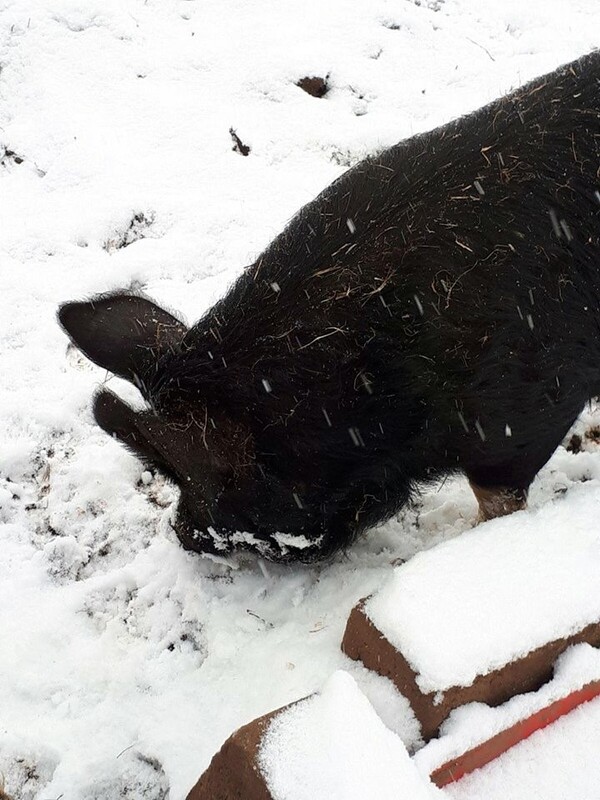 Our pigs will be a great addition to the Farm, and help us to engage more volunteers. 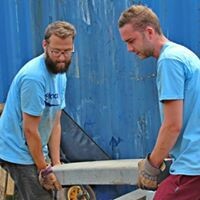 Our volunteers will not only learn how to care for the boys but also gain more understanding of where our food comes from. Many of our volunteers when asked where bacon comes from replied ‘Aldi!’. 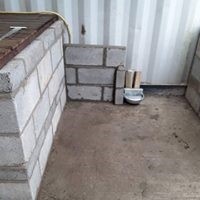 Our handyman, Dave Alison, assisted by several volunteers, built a lovely pig sty, and little run between our storage container and office and there is also a path between our raised beds leading to the field where they will have a bigger area to root around in when they want to. 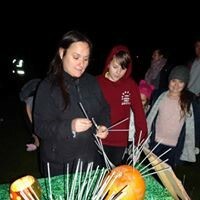 Another first for Rhubarb Farm in November was our community bonfire. 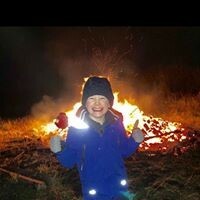 We initially expected 40/50 visitors but the guest list just grew and grew and we had re think our plans to hold it on the Farm and relocate to the recreation ground adjacent to us. The night was a fantastic success and we will be repeating the event next year! In previous years we have invited our volunteers to join us for Christmas dinner at the local pub. However as costs rise, and we all feel the pinch, we realised that this was far too expensive and we had to think of another way to celebrate the season. We decided that cooking the dinner ourselves was the answer – but then we had the problem of where to seat everyone! Our little café only seats 12, and 47 volunteers had already accepted our invitation! The only resolution was to erect our party tent and eat the lunch outdoors, with so many people and with the help of our greenhouse heaters it wasn’t too bad. 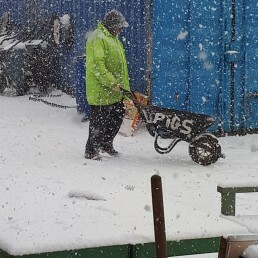 It turned out to be much more fun than the pub and by keeping the cost to a minimum also meant that all of our volunteers could join in. Afterwards, Jennie had organised a game of The Family Coach, a parlour game from Victorian times to get us all moving and work off the dinner. Most of us were reluctant to join in but it was actually great fun and ended the day with much laughter (and exhaustion). 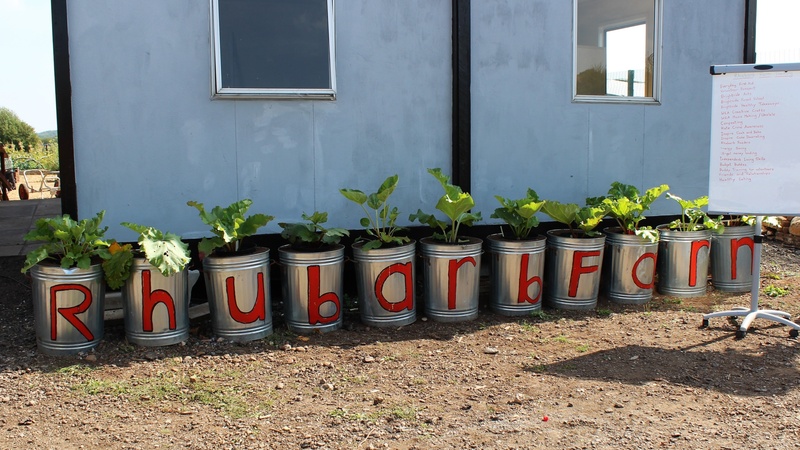 January is always a quiet time on the horticulture front at Rhubarb Farm, but it does give us the opportunity to get our house in order for the coming year. 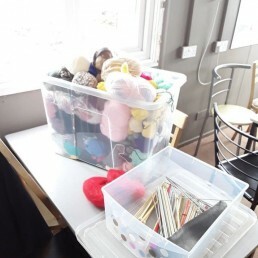 There is always lots of sorting of mending to be done and Debbie, our volunteer coordinator, likes nothing more than good fettle. She roped in Martin, one of our lovely buddy workers, to empty our green storage container and it was the sorted and divided into useful stuff and the not so useful. 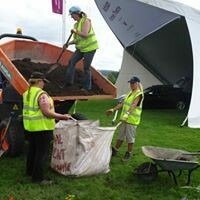 As part of our preparations for the coming year, Jennie conducted a series of compost workshops to ensure we are getting the best product possible from all our waste. The course is light-hearted and simple to understand but at the same time informative and thought provoking. 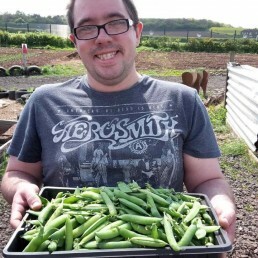 All staff and volunteers take part even our younger volunteers who are with us on school placements. 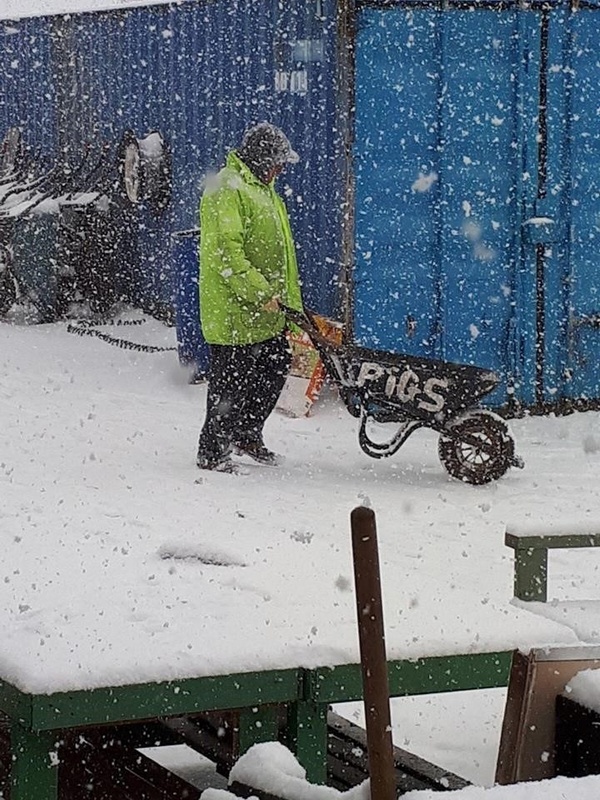 February 2018 – The Beast from the East! 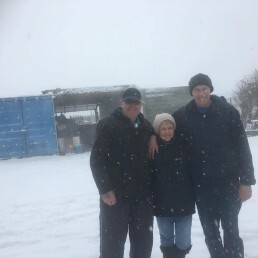 It takes more than a blizzard to stop Rhubarb Farm getting on with everyday chores! We have animals in our care and it is always our priority to ensure they are safe and well. 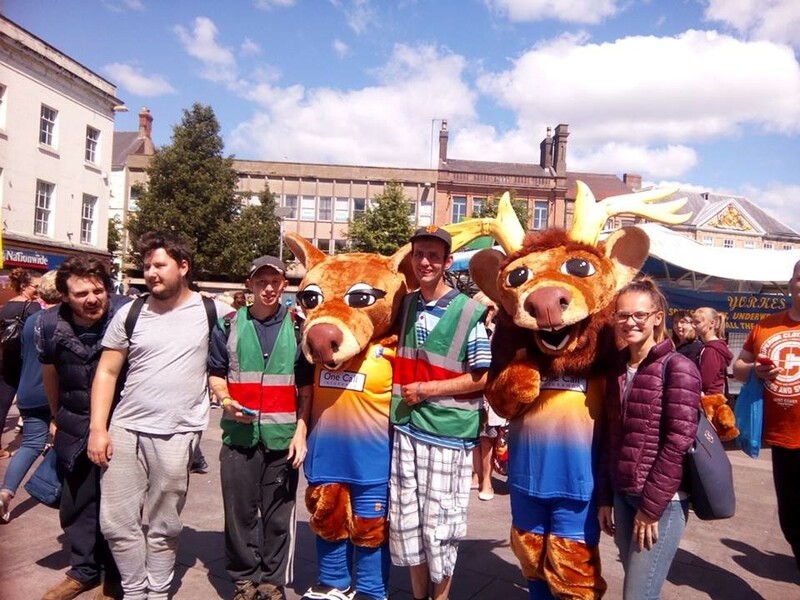 Staff and volunteers came from all over, some on the bus, one by car from Mansfield, some walking from Shire brook, and some with a lift from Worksop. 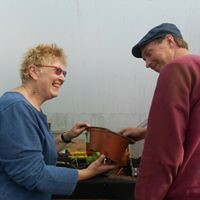 “I’d only be sitting at home alone,” one volunteer said, and today was one for memories of a different sort of fun at the Farm. 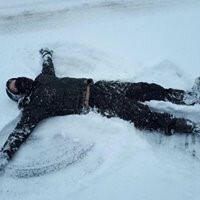 After the snow comes the thaw! We returned to the Farm after the weekend to find both our mess room and café under water when the copper pipes had burst. 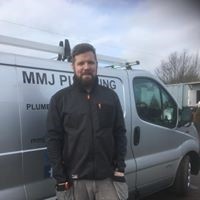 The wonderful Mark Jones of MMJ Plumbing in Whitwell came to the rescue. He replaced split copper piping and checked everything over and gave us advice on protection to stop it happening again, and he did all this free of charge! 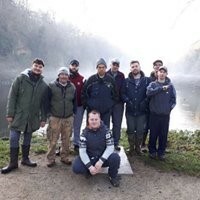 Volunteers and staff all worked hard to clear up and put everything back. 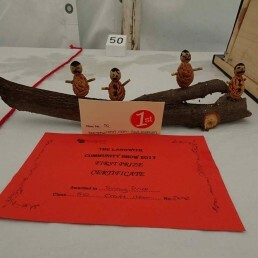 Fortunately all was back in order in time for our very first Rhubarb Knocker Knitter group session. 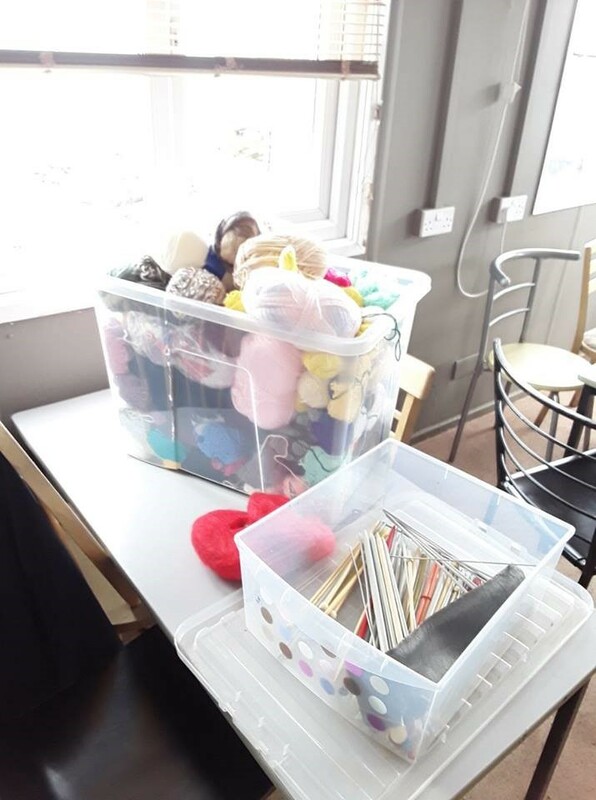 We have tried previously to a start a knitting group but feel it will be more successful if the group had more structure and a purpose. After some research we discovered that there is a need for more knitted breasts to be produced for ladies post surgery that are unable to tolerate the standard false items on offer. The knitted breasts can be made in all cup sizes are 100% cotton. 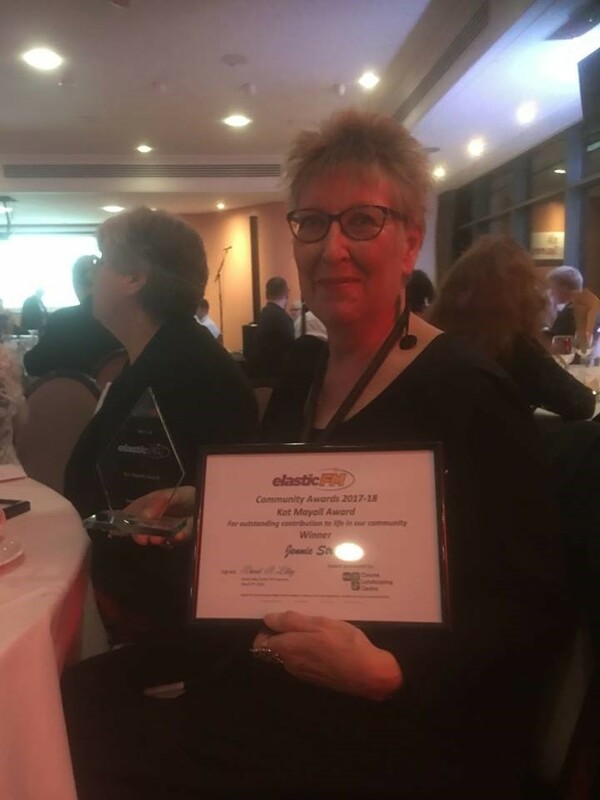 Rhubarb Farm won awards at the Elastic FM Community Awards on 9th March. 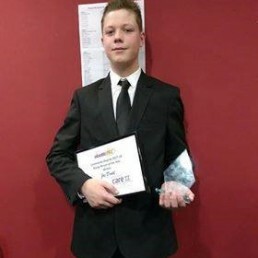 Volunteer Joe Dodd was co-winner of the Young Person of the Year award. 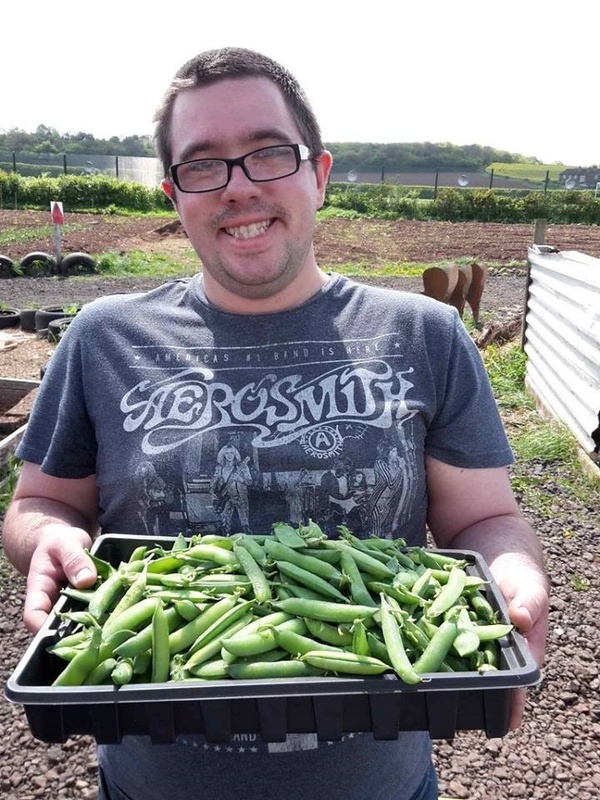 Joe has been coming to Rhubarb Farm from Heritage High School for 2 years. 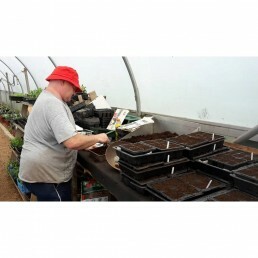 He has overcome a lot of difficulties and become a valued volunteer. 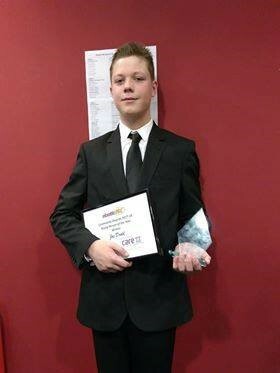 In September last year we secured Joe a stint of work experience with a local company, Clowne Landscaping, who were so impressed with Joe they have now offered him an apprenticeship when he leaves school this summer. Well done Joe, we are proud of what you have achieved. At the same awards ceremony, Jennie received a very special award, the Kat Mayall award. 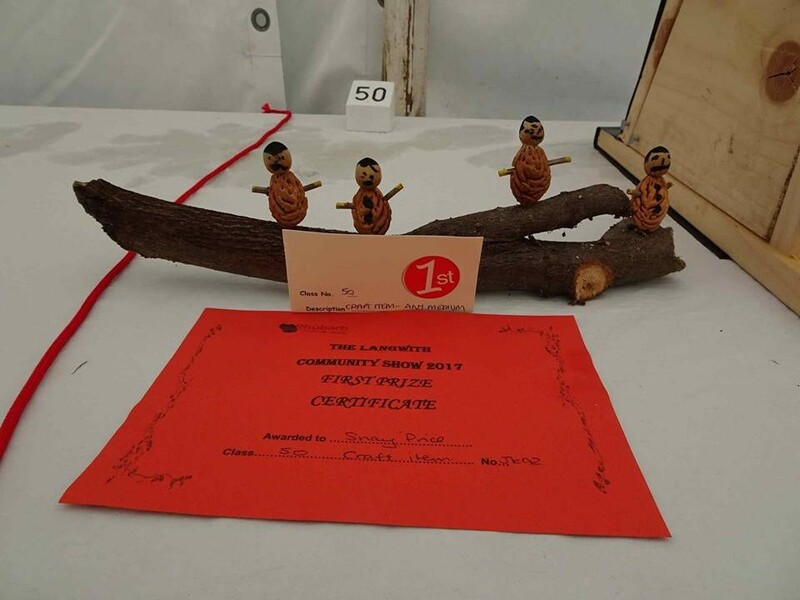 The award is given to recognise ‘Outstanding Contribution to Life in the Community’ a very fitting tribute to Jennie and well deserved. Kat was a young woman who volunteered at Elastic FM, but died sadly in 2016, the award is presented each year in her memory. 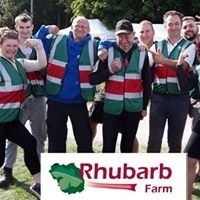 May is one of our busiest months at Rhubarb Farm and its all hands on deck to get the land prepared for the planting out to commence. 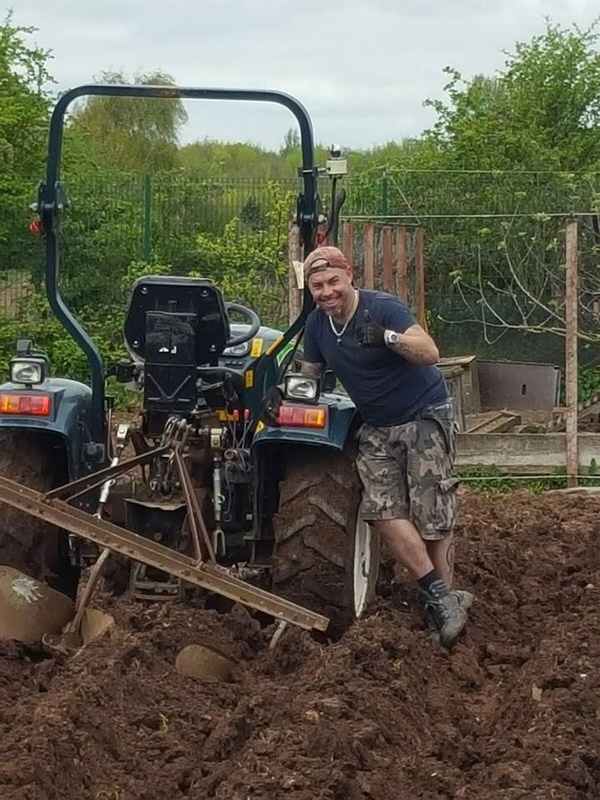 Despite the fact that we have our trusty old tractor the majority of the work is still done by hand, hard work but very rewarding. 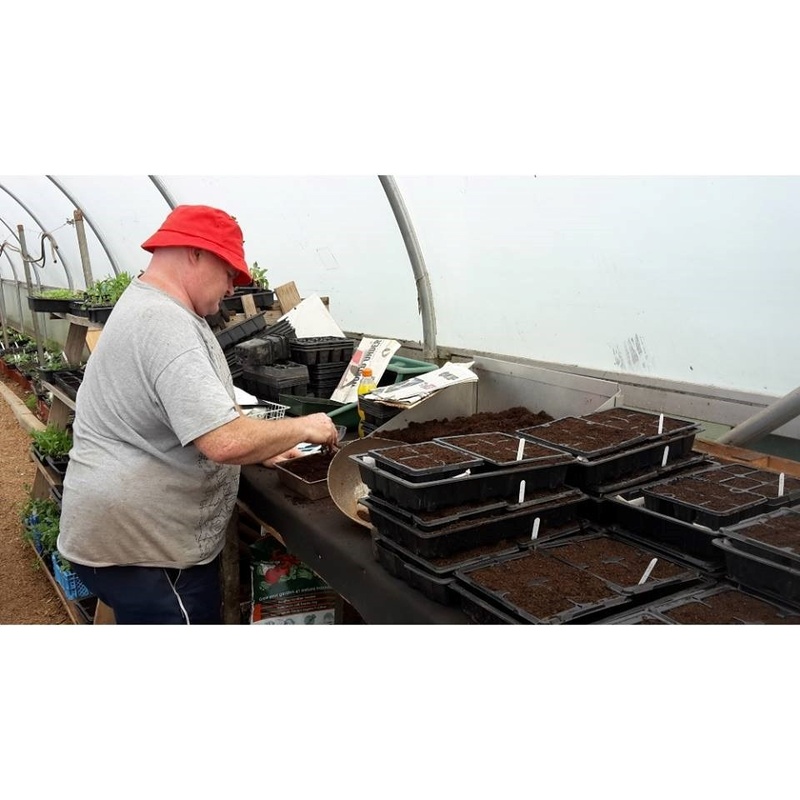 Volunteer Andy takes control in our sowing area, keeping a watchful eye on less capable volunteers, he is a great asset to Rhubarb Farm and a great support to Emmy who is responsible for our horticulture. 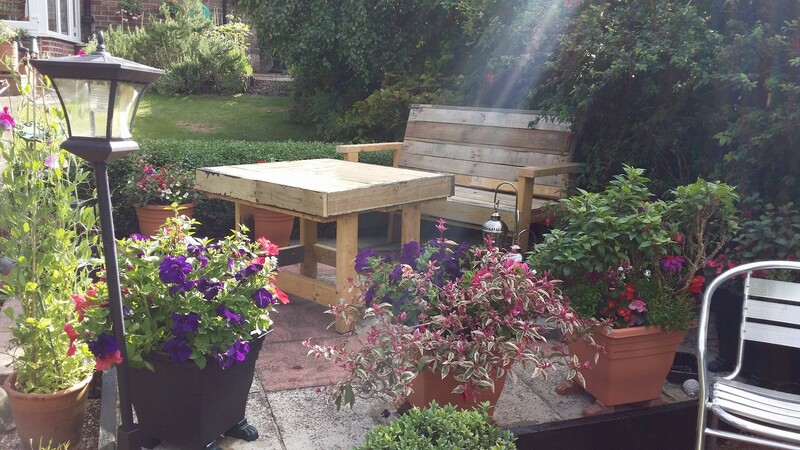 May also saw the completion of two new structures, both the creation of our wonderful handyman Dave, with the help of volunteers. 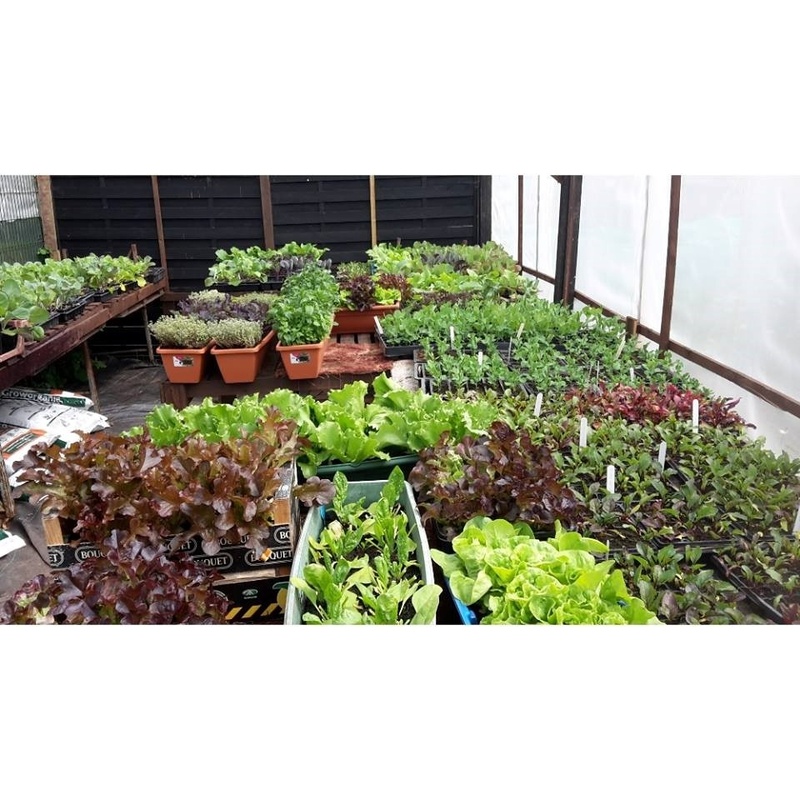 The first is our new pot store, built entirely from donated pallets, genius, and finally we have a home for all our trays and pots, all under one roof. 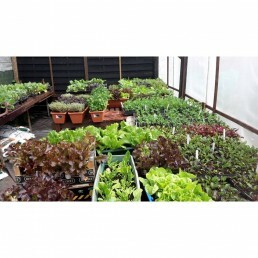 The second great addition is the new hardening off area. 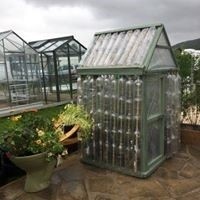 Again constructed by Dave and his faithful team of volunteers, covered with flea beetle netting to protect the tender plants as they mature. 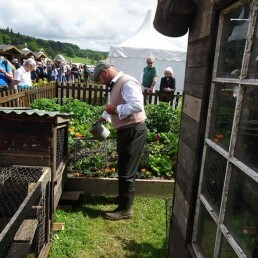 We once again had the opportunity to be involved with the RHS Chatsworth Flower Show. 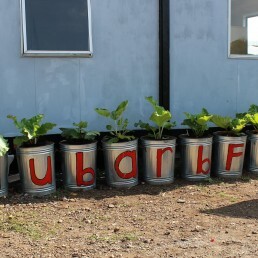 We were invited by our close friends at The School of Artisan Food to create edible planters for use in their cookery demonstrations. 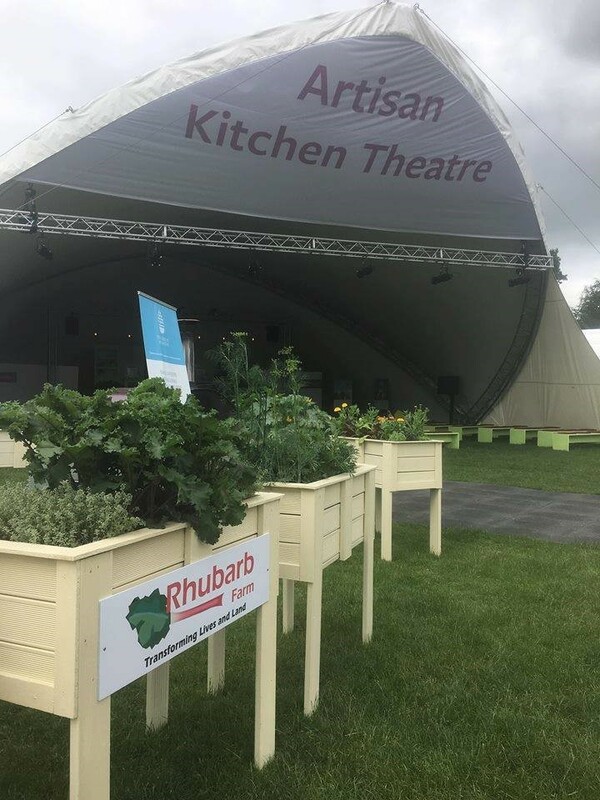 It was, again, a great experience for our volunteers to be involved in such a huge event and for us to spread the word about the work that we do., especially as Jennie was invited to take to the stage to talk about Rhubarb Farm. 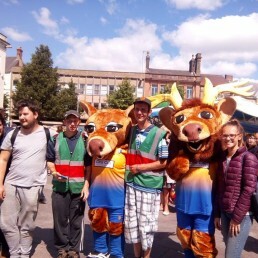 Some of our staff and volunteers took part in Mansfield’s ‘One Walk’ in aid of giving a voice to people with learning disabilities and autism. 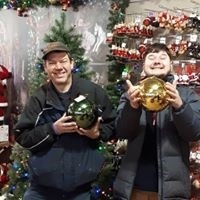 We made a day of it by visiting Mansfield Museum and a spot of shopping, lunch and lots of fun. 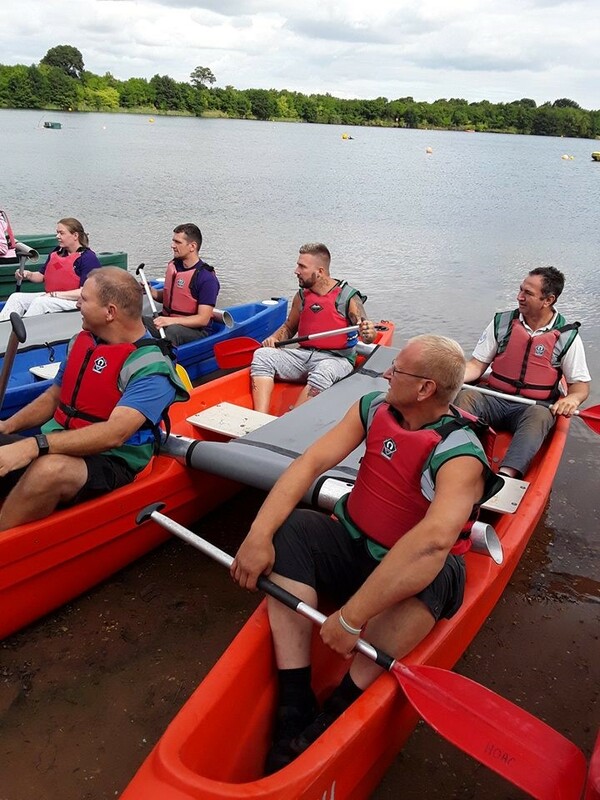 On Friday 17th August a team of 8 staff and volunteers took part in the Recovery Games in Hatfield. 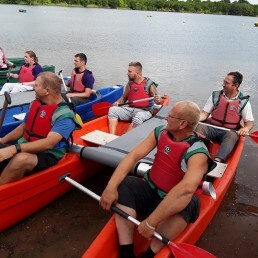 The Recovery Games organised by Aspire and are to celebrate the recovery from drug and alcohol dependency they are an opportunity for us to work together with other organisations who also support people with the same problems. 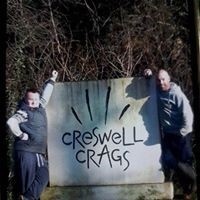 Everyone had a fantastic day and are already looking forward to taking part next year. Ground work started in readiness for the delivery of our ‘new’ training room (a second hand port cabin in need of major refurbishment). 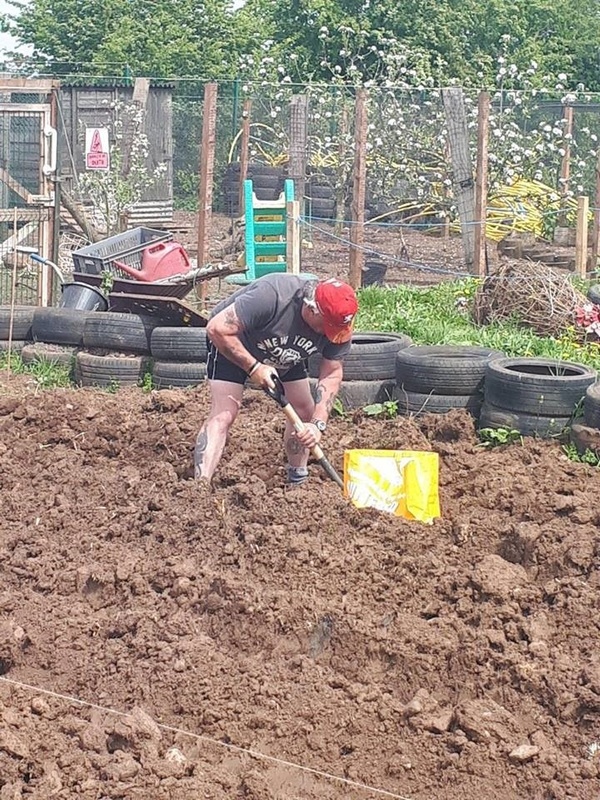 The probations service kindly brought along teams to help with the ground work as we had an awful lot to do in a short space of time. Actually transporting the large cabin here proved a major challenge, mainly due to the age and condition of it .Once completed the ‘new’ cabin will provide us with a fantastic space for our volunteers to gather together in a comfortable environment for activities and training sessions that we have planned for the colder months. 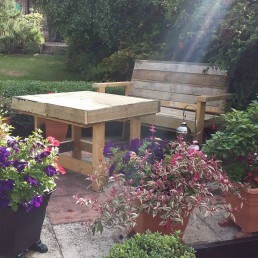 Here is the cabin in its final resting place, still refurbishment work to be completed but it is well under way.